India dished out a clinical performance to outclass the West Indies by 224 runs. 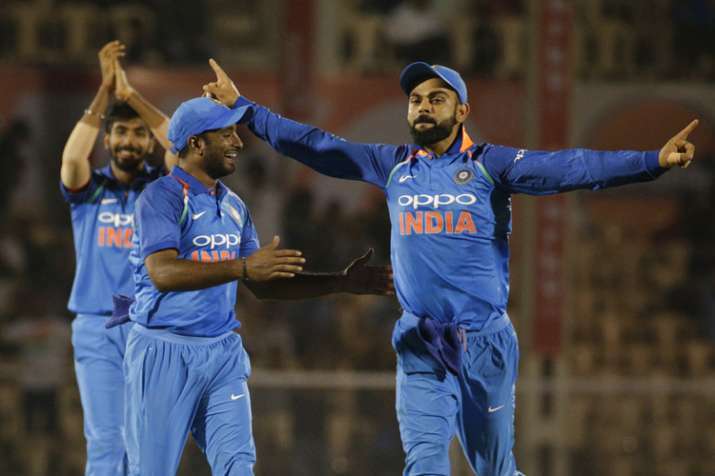 India dished out a clinical performance to outclass the West Indies by 224 runs, their biggest margin of victory against the Caribbean side, in the fourth One-day International (ODI) on their return to the Brabourne Stadium here on Monday. The victory is India's third biggest by margin of runs against any side. With the win, India also took a 2-1 lead in the five-match rubber with one match having been drawn. After posting a massive 377/5, thanks to centuries from Rohit Sharma (162) and Ambati Rayudu (100), the home side relied on a disciplined bowling effort led by the rookie left-arm quick Khaleel Ahmed (3/13) and chinaman Kuleep Yadav (3/42) sharing six wickets between them, to skittle the tourists for a meagre 153 in 36.2 overs. Facing a daunting target, the Windies never looked in the hunt with Khaleel ripping through the middle order, comprising Marlon Samuels (18), Shimron Hetmyer (13) and Rovman Powell (1) after the top three departed with mere 20 runs on the board. Earlier, Bhuvneshwar drew first blood for the hosts with the wicket of opener Chandrapaul Hemraj (14), before a couple of run-outs of Kieran Powell (4) and the in-form Shai Hope (0) further derailed the chase. Skipper Jason Holder (54 not out off 70 balls; 4X1, 6X2) raged a lone battle but with wickets falling at regular intervals, it was only a matter of time for the Indian bowlers, especially Kuldeep, whose figures of 3/42 was instrumental in cleaning up the tail. Earlier, Rohit belted an explosive 137-ball 162, laced with 20 boundaries and four sixes, but importantly crucial from the team's point of view, forged a 211-run third wicket stand with the other centurion Rayudu (100 off 81 balls; 4X8, 6X4) to propel the hosts to a mammoth 377/5. Electing to bat, India raced to a brisk 71-run opening stand between Shikhar Dhawan (38) and Rohit, but were jolted once again with the second wicket of skipper Virat Kohli (16) falling in the span of 30 runs.A rare failure after three consecutive tons, Kohli's early departure gave Rayudu, the newly-anointed No.4 the perfect platform to not only stamp his authority but also cement his place in the build up to the ICC World Cup in 2019. The 33-year-old Rayudu steadily brought up his half century before matching his partner shot by shot until off-spinner Ashley Nurse got the back of the opener caught at third man by Hemraj. The Hyderabadi right-hander continued milking the tourists and in the company of an off-colour Mahendra Singh Dhoni (23), reached his third ODI century off 80 deliveries before eventually being run out. Brief Scores: India 377/5 (Rohit Sharma 162, Ambati Rayudu 100; Kemar Roach 2/74) beat West Indies 153 (Jason Holder 54 not out, Keemo Paul 19; Khaleel Ahmed 3/13, Kuldeep Yadav 3/42) by 224 runs.